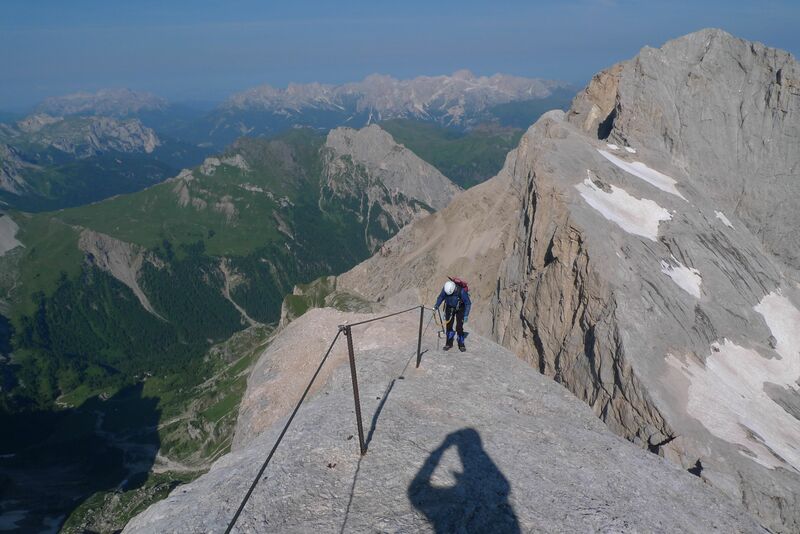 The West Ridge of Marmolada VF4D – a Via Ferrata not to be missed! 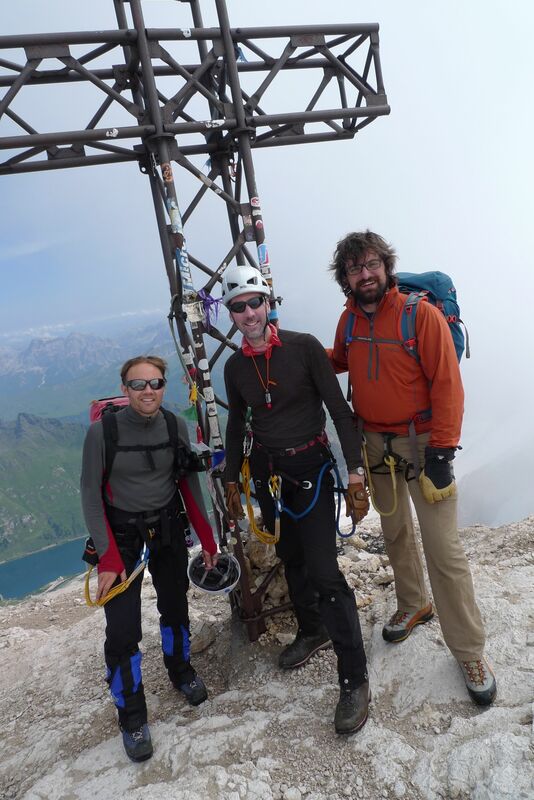 Of all the peaks in the Dolomites, Marmolada is perhaps the most varied. Not only does it have its famous south wall, an 800m high, 2km wide precipice, but on its northern slopes, the largest glacier in these parts and its long crest with its jagged skyline. What’s more, the activities which it can host are just as varied, with glacier piste skiing and off piste, ski touring, ice climbing, rock climbing, pottering in the high altitude cable car station, investigating the WW1 relics… but perhaps the most interesting for many of us are it’s two Via Ferratae. 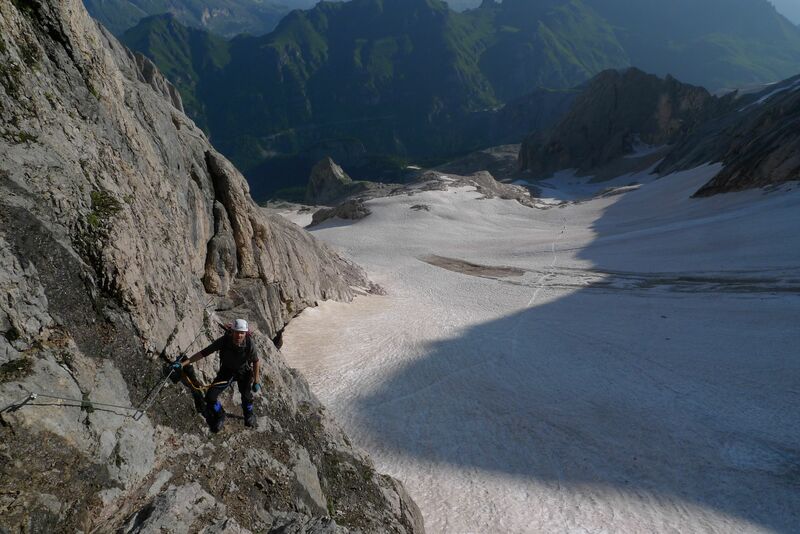 The Eterna is one of the longest Via Ferratae you will find anywhere, whilst the West Ridge is the only truly Alpine route of its type in the Dolomites, where crampons and an ice axe are an essential part of the equipment you take with you. The ridge is of modest technical difficulty, but don’t be fooled, to undertake this route you must have a good head for heights and be mountain savvy. The narrow descent slopes is not somewhere you would want to practice your ice axe arrest for the first time and the crevasses in the lower glacier slopes are real enough. If you are prepared though this is one of the most rewarding days you can have here. 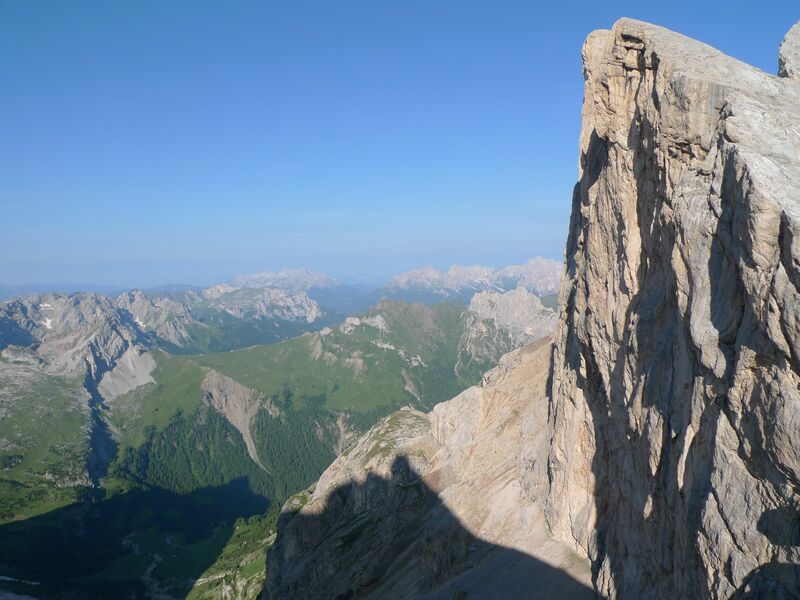 The exposure as you climb the crest of Punta Penia, Marmolada’s highest summit is simply exquisite, with the northen slope curving away to a virtual infinity, the southern side such a savage drop it would make the most seasoned scramblers head spin. That said, the equipment is in excellent condition, the cable mounted like a hand rail for much of the route to help during early season when some of the route will be buried beneath snow, preventing the cable from being entirely submerged. 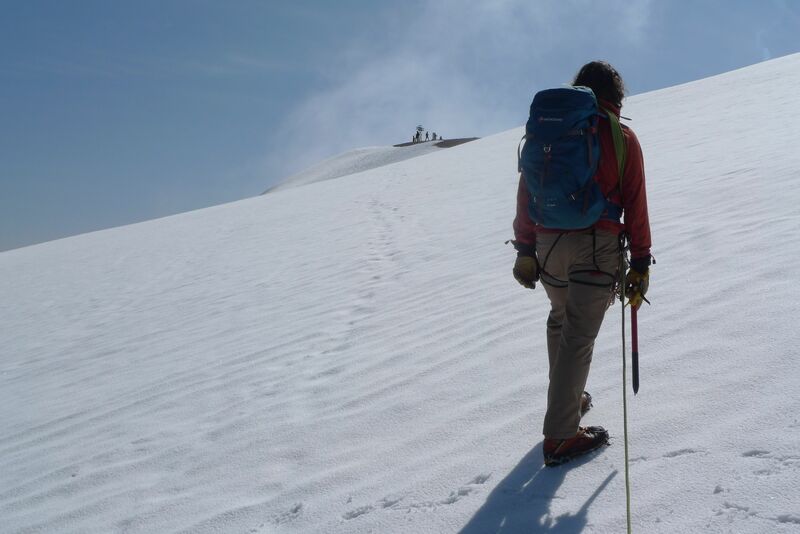 As a rope should be carried for the glacier travel, you could also be able to use it to protect a leader across buried sections if you attempt it under these conditions. The approach commences at the western end of Lago Fedaia. Here there is a large carpark by the ski lift, it can get very busy during the summer but you should be able to find a spot, especially if you are making an early morning start. Of course if you choose to do this you add a substantial height gain to your day as the lift will not be running. Usually the lifts only start after 8.30am, so if you prefer to be on your own routes, you need to add a good hour and half to your day at either end. Of course there is also the alternative – spending a night at the Rifugio Pian dei Fiacconi, allowing for a more leisurely start in the morning. From the lift and hut, descent westwards on a waymarked path, a little tricky to follow across the screes that brings you around an imposing rock buttress. You drop some 150m in height to reach this point. Once around this you will see a small glacier ascending to the beginning of the cables. Cross the glacier to the right bank of a gully – a fairly easy route in which much of the snow can be avoided by following a rocky ridge in it’s middle. If you have poles it’s questionable whether you will need crampons on to make this crossing as it’s never particularly steep and if you are accustomed to snow travel you shouldn’t struggle. On reaching the cables you will find new equipment which leads steeply to a col overlooking the mountains to the south. A couple of staples have suffered from the cold on this section with the resin holding them being a touch loose so watch your step a little. 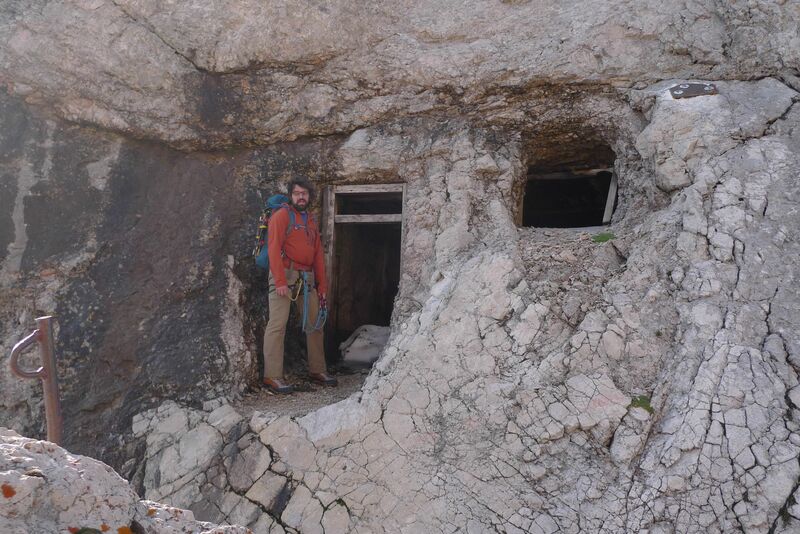 At the col there are the first remnants of the war, an old dug out shelter with the left overs of bunk beds – this route was first equipped by the Austrians as it formed the front line between Italy and Austria. There is evidence all up the route, with old pegs to which they fixed their ropes and telegraph poles for communications. That people lived here all year round is just astonishing, let alone with the primitive equipment issued to the troops. 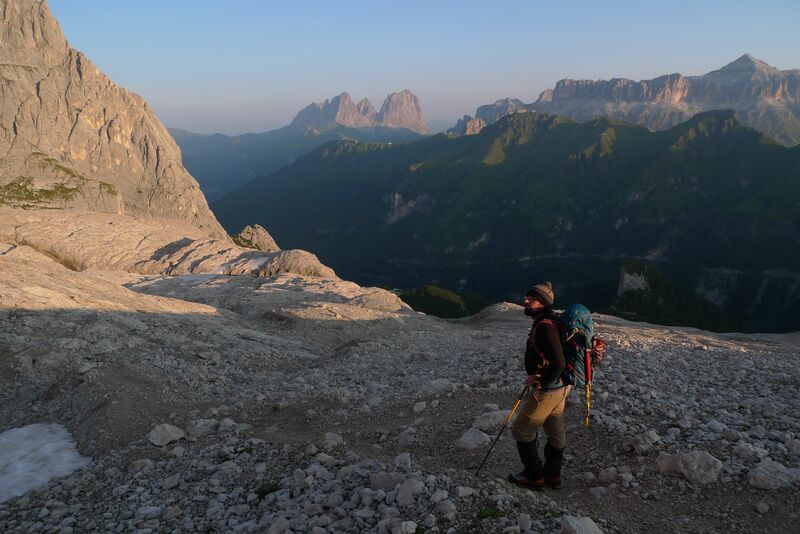 The route climbs to a shoulder and then via many ladders and pegs up onto the ridge with breathtaking views at every step of the way – Gran Vernel to the West, Cima Vernel to the south, the Cantennacio, Sassolungo and the Sella Massif in the distance – you’re spoiled for choice. All too soon the ridge rears in a final flourish before the summit. 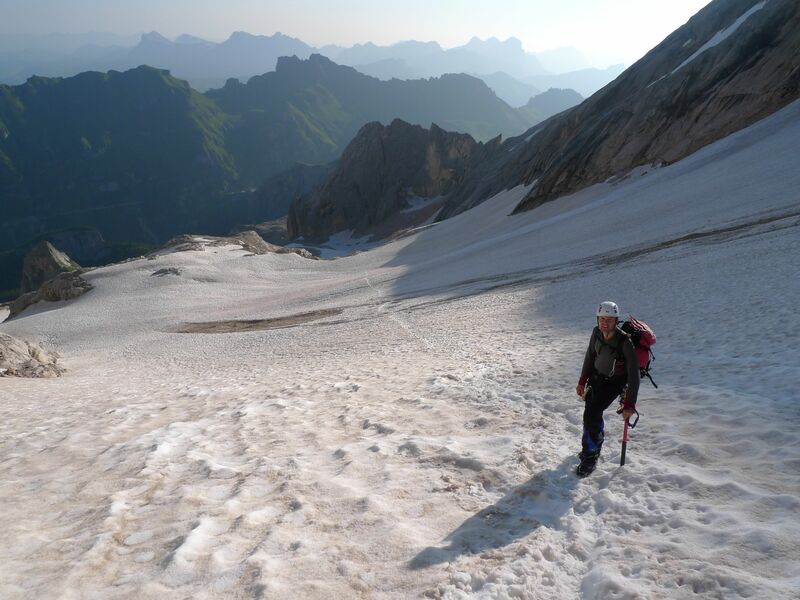 Here you can either don crampons and cross the glacier or in late season the ridge may be exposed allowing you to walk and scramble most of the way to the top. Here there is a cross for the obligatory photo’s or pull ups on the cross if you dare, and also the highest hut in the region where you can take refreshments or use perhaps the most extreme kharzi you will come across in your life! Descent is relatively straight forwards, first down a snow ridge, although be careful not to wander too far right in a white out. Soon the ridge steepens and runs to rock where a set of cables lead down and right down a set of grooves and to the lower glacier. As this is the normal route to the summit, it can get very busy, with quite literally every man and his dog coming up – this can make for some exciting maneuvers and you may get to witness some interesting tomfoolery; you’ll know when you see it. Once back at the snow, skirt the bergshrund carefully and then head back to Pian dei Fiacconi, the hut and your egress back to the car park – don’t forget to stop for your summit schnapps though! Good route description. A fabulous route to do on your own.